LG Chem has agreed with Chinese automakers Nanjing Golden Dragon Bus and Dongfeng Commercial Vehicle to supply lithium ion-based batteries for their electric vehicles (EVs), the Korean company said Sunday. "LG Chem has signed battery supplement deals with Nanjing Golden Dragon Bus and Dongfeng Commercial Vehicle," LG said in a statement. "The contract calls for LG to provide batteries for their upcoming large- and small-sized electric city buses." Company spokesman Woo Byeong-min declined to reveal the financial details. Since 2010, LG Chem, the world's largest battery manufacturer, has continued signing deals with China's leading car producers because the Korean company believes the Chinese EV market has huge potential. Nanjing Golden Dragon Bus, established in 2000, is one of the top-tier producers of electric buses in China, with an annual capacity of about 8,000 units. Dongfeng Commercial is an affiliate. "The latest agreement will significantly help us expand our portfolio to buses from sedans and sport utility vehicles (SUVs) in China, the world's biggest EV market," Woo said. He said demand for electric buses was increasing in major Chinese cities such as Beijing, Shanghai and Nanjing, thanks to more subsidies from the central government to cut carbon emissions. The statement said LG Chem was looking to electric buses to keep its growth momentum. "For example, an EV sedan uses a battery with between 10 and 30 kilowatt per hour (KWh) storage capacity," Woo said. "However, an electric bus uses a 60-200 KWh battery. The electric bus market is therefore more profitable." 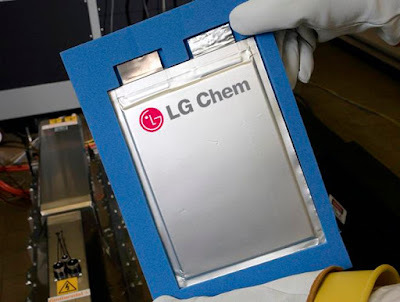 LG Chem said its battery factory in the southern Chinese city of Nanjing would begin operating next year, and would be the frontrunner among its main rivals in China. The LG Chem statement quoted President Kwon Young-soo as saying, "The Chinese EV market will boom after 2016. LG Chem is ideally positioned to lead the market, given the number of clients we have secured." KDB Securities, a local brokerage, expects demand for EVs in China to reach 350,000 by 2016 from an estimated 200,000 this year, with leading car manufacturers introducing affordable models.